Are you seeking a large lot these days? Check this one out! Lot is 11, 700 square feet. Build a granny unit and still have plenty of room for a pool. This three bedroom, two bath home sits on the curb side. 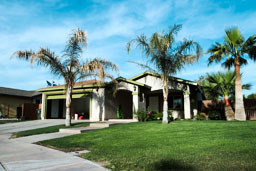 Within walking distance to Kiki Camarena Jr High and Jefferson Elementary. Full covered patio. Recently painted inside and out. This house has solar panels with a 20 year lease. The light bill is only $10 for the current home owners during the summer.